Buying eggs from farms that pasture their chickens is important for a healthy food system because you, the consumer, get superior nutrition. Just as important, though, is that farmers who are ecologically sound and respectful of their livestock can break free of a commodity mindset (where price is the deciding factor used to attract customers) and sell their products for more. In 2007 and 2008 Mother Earth News sampled and tested eggs from pasture producers from across the United States and compared the nutrition data to eggs produced by caged birds. 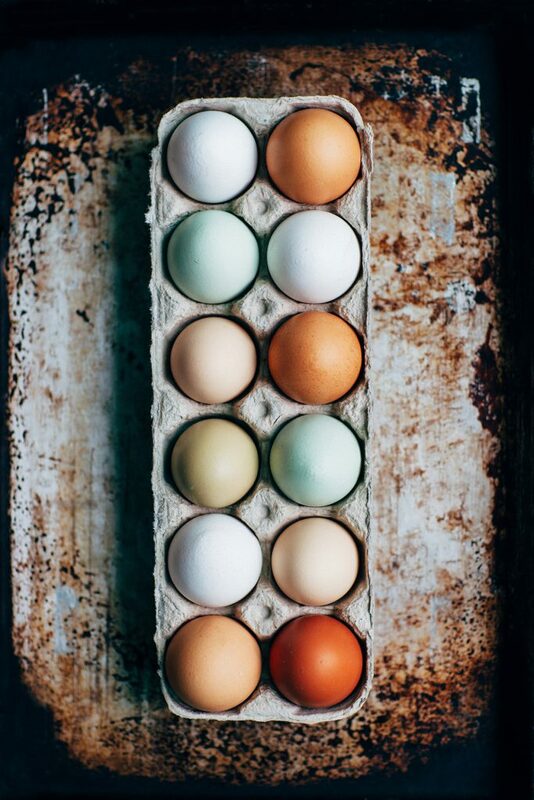 The researchers found that pastured eggs had over 3.5 times the Vitamin E, 4 times the Vitamin D, over 1.5 times the Vitamin A, 8 times the Beta Carotene and 3 times the Omega 3 Fatty Acids compared to conventionally produced eggs. Testing by Pennsylvania State University and the USDA showed pastured eggs contain 2 times the long-chain Omega 3s, 2.5 times the total Omega 3s, and half the ratio of Omega 6:Omega 3. Dietary guidelines stress reducing Omega 6s and getting 250-500 mg of Omega 3s per day. One 50-gram pastured egg provides 330 mg of Omega 3 Fatty Acids. This is comparable to wild-caught king salmon – the “Gold Standard” for seafood with 1,500 mg of Omega 3s per 3 ounce cooked portion. A 3-egg omelet would have almost 1,000 mg of locally sourced Omega 3s. If you paid $6 for that dozen eggs this would cost $1.50; the salmon portion at $15/lb. would cost $3.28. To continue the comparison, consider the vitamin content: the salmon beats the omelet only on Vitamin D with up to 988i.u. compared to 255i.u. from the pastured egg which in its favor has almost 8 times the Vitamin A at 1188i.u. and over 5 times the Vitamin E at 5.6mg. Chickens on pasture express all their inherent behaviors: scratching, pecking, sunning, dusting, hunting – all things that increase the vitamin content of the eggs, all things confinement doesn’t allow and that if denied, lead to aberrant behavior like cannibalism. Animal welfare standards require chickens to be on pasture, but this adds production costs: fencing, guard animals, and ironically, extra food. It’s a lot of work to move chickens around on a pasture, but farmers who are committed to it are trying to produce a nutrient-dense product that comes from a happy animal. Looking online, prices for pastured eggs range from $4/doz. to $9/doz. across the country. How can a consumer afford $9? The other side of the question is, how can a farmer afford to produce at $4/doz.? There are many cost analyses for egg production that show $5-$6/doz. is a fairly sound price. Some farms are willing to sell at a loss so other products can be sold. Some choose to expand production. If the amount of eggs produced is greater, the price can come down some, but there is a breaking point where the number of hens exceeds what the land can feed optimally – too many birds, not enough bugs. It’s at this point where the solution is to move them all into confinement and feed them – the result … more eggs, less nutrition. This is called industrial agriculture. Dr. Hongwei Xin, director of Iowa State’s Egg Industry Center, says the cost of production of a dozen factory eggs is $1.10/doz,. meaning eggs are selling on the wholesale market for 42 cents less than they cost to produce. However, the three-year trend for the wholesale price paid for delivered bulk eggs is $1.25/doz.1 A $0.15 margin is apparently enough for industrial producers, at least the ones that survived the 2015 Avian Flu outbreak which initially brought record egg prices due to some shortages. These shortages led to the loss of foreign and domestic markets which have not returned. Couple this with the increase in the number of laying hens over the pre-flu numbers and the result is a glut of eggs and the current low prices. In May 2017, the average national retail price was $1.41/doz.2 but grocery stores featured sales of $0.49/doz. -$0.99/doz. Data from 2013 showed 95% of the egg production in the U.S. comes from 250 companies (down from 2,500 in 1987);3 172 of these companies had over 75,000 laying hens, 59 had over 1 million, and 16 exceeded 5 million. In an article about price fixing of poultry in Georgia, FoodDive.com discusses competition: as the number of producers goes down, their control over prices goes up, which creates the possibility of price manipulation. In general, with fair competition, commodity prices go steadily up over time and remain stable. But the very nature of commodities keeps the price relatively low, so the only thing the manufacturer can do to increase profits is control costs through cheaper inputs (inferior feed) and perhaps cutting corners (worker and product safety). Or companies can cheat outright. A class action lawsuit against several egg producers for colluding to price-fix , after 9 years in court ended in an award of $135 million in settlements, approved by the U.S. District Court for the Eastern District of Pennsylvania. Two of the defendants had previously been taken to court for several other charges including pollution violations and unfair treatment of workers. Over the last 20 years, they have paid millions of dollars in fines to several state and national regulatory agencies. By the end of July 2017 they began serving time in prison for their roles in the 2010 Salmonella outbreak that sickened 2,000 people, thought to be caused by tainted feed from the defendants’ own mills. Basing the price of food on commodity prices can sometimes surprise consumers with $0.59/doz. eggs – which is $0.50 less than cost but this devalues the food; the only way quality can play a role in the pricing is if consumers refuse to buy low-quality products. So far with eggs, quality barely meets the level of “mediocrity;” however almost all stores now offer cage-free, free-range, vegetarian, organic, and sometimes even pastured eggs. If the nutrient content of a pastured egg is 2-3 times greater than a caged egg, then the price should represent this. 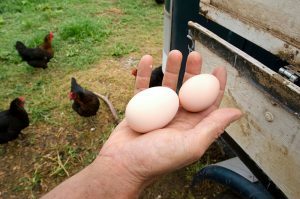 Consider a national big box chain where pastured eggs sometimes sell for $5.47; even their harshest critics would concede that this chain understands markets and profits … so surely, eggs at the farmers’ market should sell for at least this price. Price fluctuations due to futures trading, foreign market demand and trade agreements leave consumers with little choice other than to buy these specialty eggs but they are produced by the same giant producers whose track records do not encourage confidence. Of course there is an alternative which possibly is not as convenient as the chain grocery store, but when eggs are bought from the farmer, the only market forces involved are those of the Farmers’ Market.